The tour will cap off a busy 2018 for Stella who is currently supporting Natalie Prass on tour in the US. Having just wrapped up a string of headline dates in the UK/EU, she will also play a number of intimate shows in America before returning to Europe to play a series of international festival slots – including Pitchfork Festival Paris, Iceland Airwaves and Sonic City curated by Courtney Barnett – prior to heading home. In 2017 Donnelly shared her debut EP Thrush Metal. Featuring break-out tracks ‘Mechanical Bull’ and the impactful ‘Boys Will Be Boys’, the release scored the inaugural Bigsound Levi’s Music Prize, the J Award for Unearthed Artist of the Year and the WAM Award for Song of The Year. 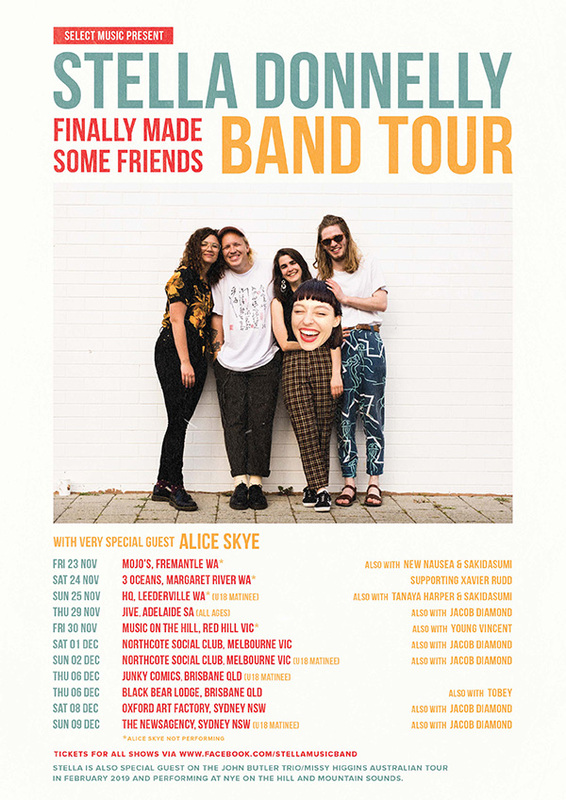 The ‘…finally made some friends’ tour will showcase the first taste of new music from Stella who was recently lauded as one of the most iconic storytellers in Australian music. Stella will round out the year at South Gippsland’s NYE On The Hill before heading to the Central Coast for Mountain Sounds Festival. She will also support John Butler Trio and Missy Higgins on their co-headline tour which kicks off in February at Kings Park in Perth. More info and tickets on the Tour page.